MapR enables organizations to create disruptive advantage and long-term value from their data with the industry’s only Converged Data Platform, which delivers distributed processing, real-time analytics, and enterprise-grade requirements across cloud and on-premise environments–while leveraging the significant ongoing development in open source technologies including Spark and Hadoop. A majority of customers achieves payback in fewer than 12 months and realizes greater than 5X ROI. MapR ensures customer success through world-class professional services and with free on-demand training. Investors include Google Capital, Lightspeed Venture Partners, Mayfield Fund, NEA, Qualcomm Ventures and Redpoint Ventures. IBM Cloud Data Services is open for data. Developers want to invent new digital experiences for customers. Data scientists search for new and unexpected trends. IT data architects make it all scale and integrate with the best technologies for the job. Built for all of these needs, IBM Cloud Data Services enable you to analyze diverse data types at high volumes with Hadoop, accelerate intelligence in every application with Spark, and more. The leader in business analytics software and services, SAS is known for analyzing big data. But did you know that SAS provides everything you need to derive insights from data stored in Hadoop? With SAS®, you get simpler data preparation processes, deeper analyses and faster answers. Create seamless access to the Pig and Hive languages and the MapReduce framework. Explore and visualize data stored in Hadoop to discover patterns and publish reports. Model data with domain-specific, high-performance analytics. Automatically deploy and execute models to score data inside Hadoop. From data to decision, we've got you covered. Learn more at sas.com/hadoopsolutions. Teradata helps companies get more value from data than any other company. Our big data analytic solutions and team of experts can help your company gain a sustainable competitive advantage with data. Teradata helps organizations leverage all of their data so they can know more about their customers and business and do more of what’s really important. With more than 10,000 professionals in 43 countries, Teradata serves top companies across consumer goods, financial services, healthcare, automotive, communications, travel, hospitality, and more. A future-focused company, Teradata is recognized by media and industry analysts for technological excellence, sustainability, ethics, and business value. Visit teradata.com. Informatica is a leading independent software provider delivering transformative innovation for the future of all things data. Organizations worldwide rely on Informatica to realize their information potential and drive top business imperatives. The Informatica Platform is an intelligent data platform, which includes data integration, data quality, master data management, data archiving and data security capabilities, to empower customers to transform raw, possibly unsafe, data into great data for more accurate insights and more effective decisions. More than 6,000 enterprises depend on Informatica to fully leverage their information assets residing on-premise, in the Cloud and on the internet, including social networks. RapidMiner, the industry’s #1 open source predictive analytics platform, is disrupting the market by empowering enterprises to include predictive analytics in any business process—closing the loop between insight and action. RapidMiner’s effortless solution makes predictive analytics lightning-fast for today’s modern analysts, radically reducing the time to unearth opportunities and risks. RapidMiner delivers game-changing expertise from the largest worldwide predictive analytics community. For more information, visit www.rapidminer.com. Sisense Business Intelligence and Analytics software lets organizations harness the true power of their data. Automated data preparation from multiple sources, a lightning-fast analytics engine and stunning visualizations take you from terabyte-scale raw data to serviceable dashboards faster than ever --- in one end to end, fully self-service platform. Arcadia Data builds the industry’s only Unified Visual Analytics and BI Platform for big data. We were founded with the singular mission to connect business users to Hadoop. The Arcadia Converged Analytics Platform™ unifies visual exploration and back-end data analytics in one integrated enterprise platform that runs natively on your Hadoop cluster. We converge the visual, analytics and data layers to provide accelerated access to all of the data stored within Hadoop, and support net-new analytics on granular datasets. BMC Software helps leading companies around the world put technology at the forefront of business transformation, improving the delivery and consumption of digital services. From mainframe to cloud to mobile, BMC delivers innovative IT management solutions that have enabled more than 15,000 customers to leverage complex technology into extraordinary business performance-increasing their agility and exceeding anything they previously thought possible. With Paxata, the pioneer of self-service data preparation market, business analysts are in the driver’s seat, interactively working on data quality, integration and semantic enrichment projects within Paxata’s collaborative workspace to meet the objectives of Chief Analytics Officers and Chief Data Officers. Paxata, booth 301, is built on an enterprise-grade platform, addressing the most stringent IT requirements for governance, automation, security and scale. Now everyone with a need for clean, contextual and complete information can prepare data without rigid processes, pre-defined models, coding or scripting. Paxata is deployed in the AWS Cloud or on premise in Hadoop or non-Hadoop environments. Pentaho, a Hitachi Group Company, is a leading data integration and business analytics company with an enterprise-class, open source-based platform for diverse big data deployments. Pentaho’s unified data integration and analytics platform is comprehensive, completely embeddable and delivers governed data to power any analytics in any environment. Learn more at www.pentaho.com. Tableau Software helps people see and understand data. Tableau’s award-winning software delivers fast analytics, visualization and rapid-fire business intelligence on data of any size, format, or subject. The result? Anyone can get answers from data quickly, with no programming required. From executive dashboards to ad-hoc reports, Tableau lets you share mobile and browser-based, interactive analytics in a few clicks. More than 35,000 customer accounts, including some of the world’s largest enterprises, rely on Tableau Software. Trifacta, the pioneer in data transformation, significantly enhances the value of an enterprise's Big Data by enabling users to easily transform raw, complex data into clean and structured inputs for analysis. Leveraging decades of innovative work in human-computer interaction, scalable data management and machine learning, Trifacta's unique technology creates a bi-directional partnership between user and machine, with each component learning from the other and becoming smarter through use. Trifacta is backed by venture capital firms Greylock and Accel and is headquartered in San Francisco. Its founders and technical advisors include global leaders in data science, interaction design and big data. Zaloni, the data lake company, is a provider of enterprise data lake management solutions. It's software products, Bedrock and Mica, enable customers to gain competitive advantage through organized, actionable big data lakes. Serving the Fortune 500, Zaloni has helped its customers build production implementations at many of the world’s leading companies. Alation is the first data catalog built for collaboration. With Alation, analysts are empowered to search, query and collaborate on their data to achieve faster, more accurate insights. Alation automatically captures the rich context of enterprise data, including what the data describes, who has used it, and the fit between the data and different types of analysis. Alation’s catalog is generated and updated using machine learning and improved through human collaboration between analysts, stewards, experts and business users. Customers include eBay, Tesla, the City of San Diego and some of the world’s largest finance and retail firms. Ataccama One is a single collaborative EIM platform connecting business and IT. It brings you a complex data management solution for any data, any domain, any user, and any deployment. Gain a substantial business value by successfully tackling your data challenges. Ataccama One offers powerful data preparation, processing, and integration capabilities. Gartner has positioned Ataccama on Gartner Magic Quadrant for Data Quality Tools and Gartner Magic Quadrant for Master Data Management of Customer Data Solutions in 2015. Canonical is the company behind Ubuntu, the leading OS for container, cloud, scale-out and hyperscale computing. 65% of large-scale OpenStack deployments are on Ubuntu, using both KVM and the pure-container LXD hypervisor for the world’s fastest private clouds. Canonical provides enterprise support and services for commercial users of Ubuntu. Canonical leads the development of Juju, the model-driven operations system, and MAAS (Metal-as-a-Service), which creates a physical server cloud and IPAM for amazing data centre operational efficiency. Canonical is a privately held company. Cask Data (“Cask”) provides the de-facto, open source big data application and integration platform that lets developers and data scientists accelerate the time to build, deploy and operate data-centric applications and data lakes; it also enables IT organizations to implement well-governed data-as-a-service environments designed to quickly unlock the value of data. Through standardized API’s, configurable application templates and visual interfaces, Cask’s flagship product – the Cask Data Application Platform (CDAP) – cuts down the average implementation time by 80%, while enabling enterprise-class governance, portability, security and transactional consistency in production Hadoop and Spark applications. ClearStory Data provides the first Data Intelligence solution that delivers a fast and easy way to access, discover, harmonize, interactively analyze, and collaboratively explore data, from diverse internal and external data sources. ClearStory's solution is an integrated Application and Platform that radically changes how people consume data from corporate and external sources, to accelerate the pace of informed and intelligent decision-making. Anyone and any organization can use ClearStory to speed the constant cycle of question to data-driven answers. The company is backed by investments from Andreessen Horowitz, Google Ventures, Kleiner Perkins Caufield & Byers, Khosla Ventures, DAG Ventures and Silicon Valley industry leaders. Continuum Analytics’ Anaconda is the leading open data science platform powered by Python. We put superpowers into the hands of people who are changing the world. Anaconda is trusted by leading businesses worldwide and across industries – financial services, government, health and life sciences, technology, retail & CPG, oil & gas – to solve the world’s most challenging problems. Anaconda helps data science teams discover, analyze, and collaborate by connecting their curiosity and experience with data. With Anaconda, teams manage open data science environments and harness the power of the latest open source analytic and technology innovations. Datameer makes big data analytics simple. Datameer gives users a unified, self-service environment to integrate, prepare, analyze, visualize, and operationalize big data analytics. Hundreds of customers, including CIOs, CMOs, CTOs, doctors, scientists, law enforcement officials, and even Olympic athletes all rely on Datameer to help them get from raw data to insight faster than ever. Datameer combines Hadoop's unlimited storage and compute power with a common spreadsheet interface and powerful functionality, quickly transforming businesses into agile, data-driven organizations. HPE Security - Data Security drives leadership in data-centric security and encryption solutions. With over 80 patents and 51 years of expertise we protect the world’s largest brands and neutralize breach impact by securing sensitive data-at-rest, in-use and in-motion. Our solutions provide advanced encryption, tokenization and key management that protect sensitive data across enterprise applications, data processing IT, cloud, payments ecosystems, mission critical transactions, storage, and big data platforms. HPE Security - Data Security solves one of the industry’s biggest challenges: simplifying the protection of sensitive data in even the most complex use cases. The Infoworks Dynamic Data Warehousing (DDW) platform enables enterprises to efficiently deliver big-data-as-a service to business analysts and data scientists. Through software automation and data organization, DDW provides a high-performance, scalable and shared data repository that supports all enterprise business analytics and reporting applications on Hadoop The DDW platform automates data ingestion, data organization and data access, and thereby eliminates the need for low-level coding. Infoworks DDW also provides the flexibility required to meet evolving needs, e.g. new data sources are easily added. Kinetica exploits the power of massively parallel graphics processing units, GPUs. We’ve developed patented technology that allows us to repurpose GPUs, originally developed to render 3D graphics, to crunch the numbers for complicated analytics and database operations. All of this happens in the cloud, which means you are free to interact with your data on any device you’d like, through a web browser or software plugin, while the GPUs do the heavy lifting. This is particularly useful for data with heavy emphasis on location or geospatial applications. Kinetica costs 10x less and performs 100x better than other enterprise database providers. RedPoint Global offers a comprehensive set of world-class ETL, data quality and data integration applications that operate in and across both traditional and Hadoop 2.0/YARN environments. The company also offers data-driven customer engagement solutions that help companies derive insights from customer behaviors and create consistent, relevant and precise messaging across any and all channels. All RedPoint applications offer a unique visual user interface that eliminates the need for programming skills, allowing enterprises to utilize all data to achieve their strategic business goals. For more information, visit www.redpoint.net or email us at: contact.us@redpoint.net. Splunk Inc. (NASDAQ: SPLK) provides the leading software platform for real-time Operational Intelligence. Splunk® software and cloud services enable organizations to search, monitor, analyze and visualize machine-generated big data coming from websites, applications, servers, networks, sensors and mobile devices. More than 11,000 enterprises, government agencies, universities and service providers in over 100 countries use Splunk software to deepen business and customer understanding, mitigate cybersecurity risk, prevent fraud, improve service performance and reduce costs. Splunk products include Splunk® Enterprise, Splunk Cloud™, Hunk®, Splunk Light and premium Splunk Apps. To learn more, please visit http://www.splunk.com/company. Talend’s integration solutions allow data-driven organizations to gain instant value from their enterprise data. Based on open source technologies, Talend equips IT departments to be more responsive to the demands of the business, at a predictable cost. Talend’s scalable, Spark-based solutions address all existing and emerging Big Data integration requirements both on-premise and in the cloud. Talend is privately-held and headquartered in Redwood City, CA. For more information, please visit www.talend.com. In today’s data-intensive world, your business is only as fast as your data architecture. Transform your business with the only purpose-built database for fast data. VoltDB makes your business applications smarter and faster while simplifying your system architecture. With our deep knowledge and experience, VoltDB helps you convert fast data into insight and business value. We help clients design, build and run insight driven organizations by helping to maximize the potential value of analytics and information to deliver operational excellence, new products and services, competitive agility, and growth. Analytics and Information Management services offers an integrated approach with our broad range of solution offerings including: shape strategy, manage data, deliver information, improve performance, optimize insights, amplify intelligence, build capabilities, and manage environments. Waterline Data offers a Smart Data Catalog to find, understand and govern data in your data lake to accelerate the time to value for self-service analytics. Ours is the only complete data catalog created from actual data, blending automated data discovery, tribal data knowledge crowdsourcing and agile data governance. Attivio makes information meaningful, accessible, and actionable in ways that were never before possible. Our patented Active Intelligence Engine® (AIE®) brings together information from any source or format and enriches it to expose the relationships, patterns, and insights that are hidden within. AIE's flexible design enables business and technology leaders to speed innovation through rapid prototyping and deployment, while dramatically lowering risk. Systems integrators, independent software vendors, corporations and government agencies partner with Attivio to automate information-driven processes and gain competitive advantage. For more information visit www.attivio.com. Basho Technologies, the creator and developer of the world’s most resilient databases, is dedicated to developing disruptive technology that simplifies enterprises’ most critical distributed systems data management challenges. Riak® KV, the industry leading distributed NoSQL database, was Basho's first product offering and is used by fast growing Web businesses and one-third of the Fortune 50 to power their critical Web, mobile and social applications. Built on the same foundation, Basho introduced Riak TS, which is the first enterprise-ready NoSQL database specifically optimized to store, query and analyze time series data. Both databases are available as commercial and open source software. Comcast brings together the best in media and technology. We drive innovation to create the world’s best entertainment and online experiences. Comcast Corporation is a global media and technology company with two primary businesses, Comcast Cable and NBCUniversal. Comcast Cable is one of the nation's largest video, high-speed Internet and phone providers to residential customers under the XFINITY brand and also provides these services to businesses. NBCUniversal operates news, entertainment and sports cable networks, the NBC and Telemundo broadcast networks, television production operations, television station groups, Universal Pictures and Universal Parks and Resorts. Confluent, founded by the creators of Apache™ Kafka™, enables organizations to harness business value of live data. The Confluent Platform manages the barrage of stream data and makes it available throughout an organization. It provides various industries, from retail, logistics and manufacturing, to financial services and online social networking, a scalable, unified, real-time data pipeline that enables applications ranging from large volume data integration to big data analysis with Hadoop to real-time stream processing. Backed by Benchmark, Data Collective, Index Ventures and LinkedIn, Confluent is based in Mountain View. To learn more, please visit www.confluent.io. Global supercomputing leader Cray Inc. (Nasdaq: CRAY) provides innovative systems and solutions enabling scientists and engineers in industry, academia and government to meet existing and future simulation and analytics challenges. Leveraging more than 40 years of experience in developing and servicing the world's most advanced supercomputers, Cray offers a comprehensive portfolio of supercomputers and big data storage and analytics solutions delivering unrivaled performance, efficiency and scalability. Cray's Adaptive Supercomputing vision is focused on delivering innovative next-generation products that integrate diverse processing technologies into a unified architecture, allowing customers to meet the market's continued demand for realized performance. Dataguise is the leader in Secure Business Execution, delivering data-centric security solutions that detect and protect an enter-prise’s sensitive data, no matter where it lives or who needs to leverage it. We make data security painless, delivering the only one-stop, out-of-the-box solution that provides the highest level of protection — no programming required. We’re proud to secure the data of some of the largest, industry-leading companies that are committed to being responsible data stewards. To learn more about how Dataguise is spearheading the secure data revolution, visit: www.dataguise.com. Immuta offers a data experimentation platform that abstracts the complexities of data discovery, data policy controls and auditing of enterprise data to enable agile data science operations within highly regulated environments. Through the Immuta Platform, data scientists are able to rapidly gain access to sensitive data sources using the languages and tools of their choice, and not have to worry about complex data regulations such as data sovereignty rights, ITAR, HIPAA, etc. Immuta provides an end-to-end platform to conduct self-service data science and meet the regulatory requirements of the compliance officer, the data owner, and the CISSO. Interana is the fast and scalable event-based analytics solution that answers critical business questions on how customers behave and products are used. With Interana, key business metrics that matter most in a data-driven world - such as growth, retention, conversion and engagement - can now be analyzed and explored in seconds rather than the hours or days it often takes with existing solutions. Interana allows customers to discover and investigate these key insights easily through its visual and interactive interface, which makes data analysis a natural extension of everyone's workflow. Maana has pioneered the enterprise knowledge technology. The Maana Knowledge Platform accelerates knowledge discovery to increase profitability. Maana’s patented Knowledge Graph™ — a breakthrough invention — at the core of the platform combined with Maana’s algorithms, expedite extracting knowledge from data silos, to reveal the relationships in the context of an asset or process companies want to optimize. Global companies such as GE, Chevron, and Shell are increasing profitability with Maana by operationalizing insights into line-of-business applications for thousands of employees to make faster data-driven decisions. Objectivity, Inc. delivers massively scalable and highly performant graph analytics platforms that are proven to power mission-critical applications for the most demanding and complex datasets. With a rich history of serving Global 1000 customers and partners, Objectivity holds deep domain expertise in fusing vital information from massive volumes of data and sources to discover hidden insights at speed and scale. Objectivity enables enterprises to make better decisions with precision, scale and efficiency. Objectivity is privately held with headquarters in San Jose, California. Visit www.objectivity.com to learn more. Ryft provides high-performance data analytics at the edge, in the data center and in the cloud with the world’s fastest converged network attached storage (NAS) and compute appliances. Ryft has created the world’s fastest, easiest-to-use and most energy-efficient products for getting instant insights into any data without transformation and indexing. Today, Ryft appliances make it simple to organize, store and analyze all data—anywhere, at any time—to unlock the value trapped in data. Securonix is working to radically transform all areas of data security with actionable security intelligence. Our purpose-built advanced security analytics technology mines, enriches, analyzes, scores and visualizes customer data into actionable intelligence on the highest risk threats from inside and outside their environment. Using signature-less anomaly detection techniques that track users, account and system behavior, Securonix is able to detect the most advanced data security, insider threats and fraud attacks automatically and accurately. StreamSets builds software that reinvents how enterprises manage the dataflows that drive their business-critical analytics, applications and products in the face of data drift. StreamSets Data Collector™ is open source software for building and operating complex any-to-any dataflows. StreamSets Dataflow Performance Manager (DPM™) provides a comprehensive control panel that uniquely enables organizations to map, measure and master dataflow topologies that underpin key business processes. Founded by Girish Pancha, former chief product officer of Informatica, and Arvind Prabhakar, a former engineering leader at Cloudera, StreamSets is backed by top-tier venture capital firms including Accel Partners, Battery Ventures, Ignition Partners and NEA. Striim is an end-to-end streaming data integration and operational intelligence platform enabling continuous query/processing and streaming analytics. With Striim, you can get to know your data the instant it’s born. Striim specializes in multi-stream integration from a wide variety of data sources including transaction/change data, events, log files, application and IoT sensor data. Add structure, logic and rules to streaming data. Define time windows for analysis. Detect outliers, visualize events of interest, and trigger alerts and automated workflows – all within milliseconds. Respond faster to your customers, make better decisions, and grow your business with Striim. Syncsort is a provider of enterprise software and the global leader in Big Iron to Big Data solutions. As organizations worldwide invest in analytical platforms to power new insights, Syncsort’s innovative and high-performance software harnesses valuable data assets while dramatically reducing the cost of mainframe and legacy systems. Thousands of customers in more than 85 countries, including 87 of the Fortune 100, have trusted Syncsort to move and transform mission-critical data and workloads for nearly 50 years. Now these enterprises look to Syncsort to unleash the power of their most valuable data for advanced analytics. Whether on premise or in the cloud, Syncsort’s solutions allow customers to chart a path from Big Iron to Big Data. Experience Syncsort at www.syncsort.com. Unifi provides a comprehensive suite of self-service data integration tools and business-specific solutions to empower business users. Unifi is the only self-service platform that combines data discovery and data preparation into a single platform. This dramatically simplifies the learning curve and delivers business insights sooner. Intel, the world leader in silicon innovation, delivers hardware and software technologies to continually advance how people work and live. For over two decades, Intel's contributions to open-source projects-from one end of the solution stack to the other-have helped ensure that a breadth of solutions run exceptionally well on Intel® architecture. As a result, open-source-based solutions, running on Intel® architecture, help unlock business opportunities, power businesses, connect people, and enhance lives. Open source is bringing amazing experiences to life-and Intel is helping power these experiences as a Sponsor of Tomorrow. Zaloni is a leading provider of enterprise data management solutions. Its software products, Bedrock and Mica, enable customers to gain competitive advantage through organized, actionable Hadoop data lakes. Serving the Fortune 500, Zaloni has helped its customers build production implementations that solve today’s most complex big data analytic challenges. Aginity is based in Evanston, IL and was founded on the belief that an enterprise's analytics should be among its most valuable assets. Aginity makes software that revolutionizes the way large enterprises create, manage, and deploy analytics, allowing them to establish analytics as a new and highly valuable class of asset. With Aginity Amp users can rapidly integrate data sources, catalog predictive analytics across the enterprise and power existing execution systems to drive customer interactions. Alpine Data is the provider of Chorus - the world’s most comprehensive Advanced Analytics Platform for Big Data and Hadoop. Chorus' visual programming interface and lightweight deployment process delivers solutions that harness the power of parallel computing platforms and conducts advanced analytics at enterprise scale. Alpine Chorus is highly accessible and easy to use, enabling data experts and business analysts alike to work across organizational barriers and collaboratively utilize Advanced Analytics to make critical business decisions. Anodot is disrupting the static nature of Business Intelligence (BI) with unique real-time business incident detection, anomaly detection and analytics for big data. Using patented machine learning algorithms, Anodot automates the discovery of outliers in vast amounts of data, isolates issues and correlates them across multiple parameters. Operating in real time, Anodot delivers business insights immediately, predicts events before they happen and supports rapid business decisions that help maximize revenues and production for Web-based, e-commerce, ad tech, IoT and manufacturing businesses. The company is based in Sunnyvale, CA and Ra’anana, Israel. Contact us for a free trial. 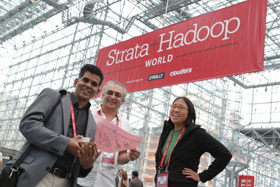 AtScale delivers the power of Hadoop into the hands of business analysts. AtScale turns your Hive warehouse into an OLAP server, allowing you to use tools like Tableau or Excel to interactively query billions or trillions of rows of data. AtScale Dynamic Cubes access the data directly in your Hadoop cluster without requiring ETL or data movement, and support modern data formats like arrays, structs, and non-scalars. With AtScale, customers can now benefit from the affordable scale that Hadoop delivers coupled with the interactive response times and business friendly interfaces that have historically been limited to scale-constrained OLAP solutions. BigR.io is a technology consulting firm empowering data to drive innovation and advanced analytics. We specialize in cutting-edge Big Data, machine learning, and custom software strategy, analysis, architecture, and implementation solutions. Bitwise is a Data Management company that uses 20 years of data experience to help bridge gaps between traditional EDW and cutting edge technologies, including big data tools. 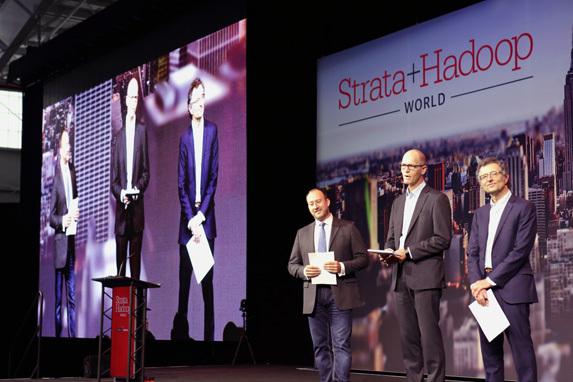 At Strata NY, we are proud to unveil Hydrograph, an Open Source ETL on Hadoop utility built in partnership with our customer Capital One to address today’s demanding big data needs. A breakthrough for Hadoop adoption, Hydrograph populates the data lake and can automate data cleansing work so Data Scientists can focus on extracting insight from their data rather than spend time cleansing and preparing their data for analysis. Capgemini Insights & Data. In a world of connected people and connected things, organizations need a better view of what’s happening on the outside and a faster view of what’s happening on the inside. Data must be the foundation of every decision, but more data simply creates more questions. With over 11,000 professionals across 40 countries, Capgemini’s Insights & Data global practice can help you find the answers, by combining technology excellence, data science and business expertise. Together we leverage the new data landscape to create deep insights where it matters most – at the point of action. LOCATION INTELLIGENCE, FINALLY INTUITIVE. CARTO is an open, powerful, and intuitive platform for discovering and predicting the key insights underlying the location data in our world. Our products unleash the power of location intelligence with self-service, actionable dashboards and analysis you can share across your whole organization. For developers, the CARTO Engine, a one-stop shop of geospatial tools, services, and APIs for discovering and predicting the key insights from your location data, empowers your organization with scalable analysis and enrichment solutions you can fully embed on your web and mobile apps. Working with CARTO is intuitive, logical, & effortless. Cloudwick is the leading provider of digital business services and solutions to the Global 1000. Its offering, Cloudwick One®, enables bimodal transformation to enhance, extend and gain competitive advantage with open source and cloud, allowing enterprises like 3M, Bank of America, Comcast, Home Depot, Intuit, JP Morgan, NetApp, Target, Visa, and Walmart to enter new markets, create new revenue and lower capex and opex. For more information, please visit www.cloudwick.com. Collibra is the industry’s only global data governance provider founded to address data management from the business stakeholder perspective. Delivered through a cloud-based or on-premise solution, Collibra is the trusted data authority that provides data stewardship, data governance and data management for the enterprise business user. Collibra automates data governance and management processes by providing business-focused applications where collaboration and ease-of-use come first. Collibra’s data governance platform embraces the new requirements of big data solutions, with automation, machine learning, and the flexibility to govern data assets from source to visualization. Databricks was founded out of the UC Berkeley AMPLab by the creators of Apache Spark. We’ve been working for the past six years on cutting-edge systems to extract value from Big Data. We believe that Big Data is a huge opportunity that is still largely untapped, and we’re working to revolutionize what you can do with it. Highly specialized in Big Data & Advanced Analytics end-to-end strategic services as a Business Analytics Company providing customized turnkey project implementation, managed services, staffing, and personalized training. DataStax powers the online applications that transform businesses for more than 400 customers, including startups and more than 20 of the Fortune 100. DataStax delivers a massively scalable, flexible and continuously available big data platform built on Apache Cassandra™. DataStax integrates enterprise-ready Cassandra, Apache Hadoop™ for analytics and Apache Solr™ for search across multi-datacenters and in the cloud. Companies such as Adobe, eBay and Netflix rely on DataStax to transform their businesses. Based in Santa Clara CA, DataStax is backed by industry-leading investors: Lightspeed Venture Partners, Crosslink Capital, Meritech Capital Partners, Scale Venture Partners, DFJ Growth and Next World Capital. DataTorrent provides fast, simple, and resilient solutions to enable you to discover the hidden value of your Big Data. Powered by the open-source platform Apache Apex, which is in production with organizations of all sizes from startups to the Fortune 10, DataTorrent delivers real-time streaming to help you ingest, process and analyze all relevant data to innovate fast and drive continuous business transformation. With DataTorrent, you get a robust, yet flexible solution you need to create an enterprise-grade data-centric foundation that scales with your business needs. Download our platform today at www.datatorrent.com. DriveScale is leading the charge in bringing hyperscale computing capabilities to mainstream enterprises. Its composable data center architecture transforms rigid data centers into flexible and responsive scale-out deployments. Using DriveScale, data center administrators can deploy independent pools of commodity compute and storage resources, automatically discover available assets, and combine and recombine these resources as needed. The solution is provided via a set of on-premises and SaaS tools that coordinate between multiple levels of infrastructure. With DriveScale, companies can more easily support Hadoop deployments of any size as well as other modern application workloads. For more information, visit www.drivescale.com. Esgyn’s mission is to empower organizations to deploy new kinds of Big Data solutions. Esgyn is the leading contributor to the Apache™ Trafodion (incubating) project. Apache Trafodion builds on the scalability, elasticity, and data structure flexibility of Apache Hadoop® and brings operational SQL capabilities, including guaranteed transactional integrity. Apache Trafodion enables the convergence of operational and analytic workloads on a single platform, avoiding multiple copies of data and massive data movement across systems. Esgyn’s premier offering is EsgynDB, an enterprise-class solution powered by Apache Trafodion. Esgyn offers support, services and training for EsgynDB that enterprises expect for their production solutions. Founded in 2012 by the team that scaled Twitter, Fauna has developed an operational database that lets enterprises adapt at scale by combining global distribution, multi-tenancy, and strong consistency with a modern, unified query language. Unlike legacy databases, FaunaDB delivers flexibility, scalability, and safety without compromise. FaunaDB is available as an elastic cloud service and as an on-premises package with zero infrastructure lock-in. FaunaDB has been in development for 4 years and is deployed at a number of early customers, including NVIDIA. For more information please visit www.fauna.com. Fuzzy Logix is a software and services company that deveops high-performance analytics solutions, including in-database and GPU-based analytics products which help companies make smarter decisions and improve effectiveness and performance. Our solutions are easy to use and deploy, highly scalable and run 10X to 1000X faster than other products. Fuzzy Logix has developed over 800 different types of algorithms that are used by finance, healthcare, retail, marketing and digital media companies, and this library continues to grow rapidly. We make analytics easy, pervasive and available real-time. GigaSpaces Technologies provides software middleware for deployment, management and scaling of mission-critical applications on cloud environments through two main product lines, XAP In-Memory Computing and Cloudify. Hundreds of Tier-1 organizations worldwide are leveraging GigaSpaces’ technology to enhance IT efficiency and performance, from top financial firms, e-commerce companies, online gaming providers, healthcare organizations and telecom carriers. GigaSpaces was founded in 2000 and has offices in the US, Europe and Asia. For more information, please visit www.gigaspaces.com or our blog at blog.gigaspaces.com. GridGain Systems is revolutionizing real-time data access and processing by offering the enterprise-grade in-memory computing platform built on Apache Ignite™. The solution is used by global enterprises in financial, ecommerce, retail, online business services, telecom, healthcare and other major sectors. GridGain solutions connect data stores (SQL, NoSQL, and Hadoop) with cloud-scale applications and enable massive data throughput and ultra-low latencies across a scalable cluster of commodity servers deployed on premise or in the cloud. The GridGain In-Memory Data Fabric offers the most comprehensive, enterprise-grade in-memory platform for high-volume transactions, real-time analytics and hybrid data processing. For more information, visit gridgain.com. H2O is fast scalable open-source machine learning and deep learning for Smarter Applications. With H2O enterprises like PayPal, Nielsen, Cisco and others can use all of their data without sampling and get accurate predictions faster. Advanced algorithms, like Deep Learning, Boosting and Bagging Ensembles are readily available for application designers to build smarter applications through elegant APIs. Some of our earliest customers have built powerful domain-specific predictive engines for Recommendations, Customer Churn, Propensity to Buy, Dynamic Pricing and Fraud Detection for the Insurance, Healthcare, Telecommunications, AdTech, Retail and Payment Systems. Hadoolytics is a global consulting and software development company with a laser focus on Cloud & Big Data services and solutions. Our exceptional technical depth coupled with a broad range of skills across the Cloud & Big Data spectrum allow us to differentiate from the competition in helping organizations transform their applications and data into business results. The iguazio Enterprise Data Cloud is a next gen data platform-as-a-service enabling a single, secure, high-performance deduplicated source of data, deployed on-premises or in hybrid cloud architectures. The iguazio platform enables the agile enterprise with seamless integration into modern applications over a commodity-based infrastructure. Impetus is a provider of innovative Big Data solutions and services. We empower enterprises in the financial services, healthcare, digital media, travel and entertainment, and manufacturing industries to gain big business impact from Big Data. We use proven methodologies spanning the full life-cycle of architecture advisory, proof of value, data science, application development and implementation services. We are experts in the complete Big Data ecosystem, including Hadoop, Cassandra, NoSQL, MPP systems, real-time and predictive analytics, machine learning, visualization, cloud computing and enterprise mobility. For more information, visit bigdata.impetus.com. InfoTrellis has pioneered the first Customer Intelligence Management System, which is one part data management and one part analytics. AllSight was created based on one fundamental premise – customer data always evolves; therefore, a customer intelligence management system must be built to evolve. InfoTrellis AllSight utilizes big data technology - Hadoop, Machine Learning, and Analytics - to continually ingest and understand any source of customer data, and produce deep, actionable customer intelligence to be used in marketing, customer care, and sales systems. JethroData is a unique SQL and Indexing engine for Hadoop. It works by automatically indexing data as it is written into Hadoop. Queries use indexes to access only the data they need instead of performing a full-scan of the entire dataset, leading to both a dramatic improvement in speed and a substantial reduction in computing resource usage. Jethro is optimal for use cases such as interactive ad-hoc queries, live dashboards and rapid reports where queries typically access a portion of the data. With Jethro, you enjoy the scalability of Hadoop with the performance of an analytical database, in one system. jSonar makes Big Data simple. The jSonar Analytics Platform provides an innovative JSON-based capability for Big Data warehousing and a suite of rich analytic tools. SonarW, a core component of the platform is the industry’s first NoSQL Warehouse. SonarW delivers unprecedented performance, cost savings and vastly simplifies complex Big Data warehousing projects. jSonar also provides powerful analytic tools such as jSON Studio, SonarR, SonarSQL and Sonar Gateway. For more than a generation Kognitio has been a pioneer in the development of scale-out, in-memory software for big data analytics. Today the Kognitio software provides an ultra-fast, high concurrency SQL layer that allows modern data visualization tools to maintain interactive performance, even when the data volume is large and the user count high. Kognitio is fully integrated with YARN and can run on existing Hadoop clusters or, for non-Hadoop data sources, can be installed on a standalone hardware infrastructure. The software also supports sophisticated NoSQL capabilities enabling scale-out advanced analytics alongside the ultra-fast, fully functional SQL. To learn more visit kognitio.com. Kyvos Insights unlocks the power of big data lakes for BI users with its patent pending “OLAP on Hadoop” technology. By helping big data analysts create a BI Consumption Layer, Kyvos securely allows analysts direct access to Hadoop using their favorite BI tools with instant query response times. No coding required. Backed by data analytics veterans from Yahoo!, Impetus and Intellicus, Kyvos provides the ability to visualize, explore and analyze data natively on Hadoop. Looker brings data culture to over 450 industry-leaders such as Yahoo!, Warby Parker, Hudson Bay, and Sony. Looker allows a data analyst to curate and centralize massive amounts of data – creating a crucial single source of truth – and an easy way for every business team to quickly ask and answer their own questions. The company is headquartered in Santa Cruz, California, with offices in San Francisco, New York, and London. Investors include KPCB, Meritech Capital Partners, Redpoint Ventures, First Round Capital, Sapphire Ventures, and PivotNorth. For more information, follow @lookerdata or visit looker.com. * Business Intelligence, Analytics, Data Discovery * Competition: Looker’s competition includes modern BI solutions from IBM-owned Cognos, Tableau, QlikTech, and others, as well as legacy BI platforms from the likes of SAP, Oracle, or GoodData. MapD is a next-generation database and visualization layer that harnesses the parallel power of GPUs to explore multi-billion row datasets in milliseconds. By combining a purpose-built GPU database with a stunning visualization layer, MapD is able to deliver immersive, instantaneous analytics on data sets previously considered too large to explore interactively. The speed and scope of MapD’s solutions enable organizations to compete more effectively, to solve more complex problems and to manage operational risk more comprehensively. Founded in 2013, MapD is funded by Google Ventures (GV), Nvidia, Vanedge Capital and Verizon Ventures. MathWorks is the leading developer of mathematical computing software. MATLAB, the language of technical computing, is a programming environment for algorithm development, data analysis, visualization, and numeric computation. Engineers and scientists worldwide rely on MATLAB for a range of applications, including signal processing and communications, image and video processing, control systems, test and measurement, computational finance, and computational biology. Visit us to see how MATLAB can help you explore big data, develop analytics, and integrate MATLAB based analytics into Hadoop and other production IT environments. By offering the best of traditional databases as well as the flexibility, scale, and performance required by today’s applications, MongoDB lets innovators deploy apps as big as they can possibly dream. From startups to enterprises, for the modern and the mission-critical, MongoDB is the database for giant ideas. Mu Sigma, one of the world's largest decision sciences and analytics firms, helps companies institutionalize data-driven decision making and harness Big Data. We solve high-impact business problems in the areas of Marketing, Risk and Supply Chain across 10 industry verticals. With over 2000 decision science professionals and more than 75 Fortune 500 clients, Mu Sigma has driven disruptive innovation in the analytics industry with its interdisciplinary approach combining business, math and technology, and its integrated decision support ecosystem comprised of technology platforms, processes, methodologies and people. Novetta delivers agile big data analytics that empower our customers to quickly extract value from massive amounts of data and make confident, data-driven decisions. Novetta Entity Analytics is the first to offer high-speed, high quality, entity resolution natively on Hadoop. Novetta Entity Analytics provides unified views of people, locations, organizations, events, and relationships across multiple systems and sources so you can connect the dots and start solving your business problems. Whether it is business intelligence, customer and marketing analytics, or fraud and risk analysis, Novetta can help you quickly tear down silos to uncover the insights that drive better decisions. Pepperdata develops software that governs and guarantees consistent, peak performance of Hadoop clusters from hundreds to thousands of nodes. Pepperdata provides the only solution that can anticipate and avert cluster performance issues. Its Adaptive Performance Core™ captures and processes second-by-second performance data to reshape each application’s usage of CPU, RAM, network, and disk without user intervention. Performance is enforced based on user-defined priorities and current cluster conditions, eliminating critical hardware contention and the need for workload isolation. By guaranteeing stable and reliable cluster performance, Pepperdata allows enterprises to realize untapped value from existing distributed infrastructures. Big Data is all we do. We are the world’s largest pure-play Hadoop and Spark services firm backed by Apache ecosystem committers and contributors. We thrive on the speed of Big Data innovation with a keen eye on stability and results. The worlds best known brands in healthcare, med-device, CPG, retail, software, and finance rely on phData to deliver Hadoop. phData offers the Industry's First Flat-Fee Managed Service for Hadoop. A stable and well-managed Hadoop cluster is the foundation of success. Our team of Hadoop engineers and administrators specialize in building automation and excellence in cluster operations. Podium Data is redefining enterprise data management with its practical, high performance data lake management software platform. Headquartered in Lowell, Massachusetts, Podium’s seasoned team of entrepreneurs has deep expertise in analytics, big data and enterprise data management. A growing list of Fortune 500 companies use Podium to accelerate delivery of data to business users through a variety of enterprise scale data lake, extraction/transformation, and load migrations; and analytic projects. More information is available at www.podiumdata.com and on Twitter at @PodiumData. Profium Sense is a native graph database that provides a flexible schema and the power to link your datasets together and make those links available for complex queries. Profium Sense has a configurable rule engine, built-in GIS Functionality and full-text index to provide advanced query capabilities to power real-time business applications and mobile services. With Profium Sense you achieve your business targets faster with features that help you differentiate from competition and traditional database solutions. Protegrity: Proven Experts in Data Security Protegrity is the only enterprise data security software platform that leverages scalable, data-centric encryption, tokenization and masking to help businesses secure sensitive information while maintaining data usability. Built for complex, heterogeneous business environments, the Protegrity Data Security Platform provides unprecedented levels of data security certified across applications, data warehouses, mainframes, big data, and cloud environments. Companies trust Protegrity to help them manage risk, achieve compliance, enable business analytics, and confidently adopt new platforms. For additional information visit www.protegrity.com. Qubole was launched in 2013 by Ashish Thusoo and Joydeep Sen Sarma from Facebook's Data Service Team and authors of Apache Hive. Qubole simplifies provisioning, managing and scaling of big data analytics workloads leveraging data stored on AWS. Once IT sets policies, any number of data analysts can be set free to collaboratively “click to query” with the power of Hive, Spark, Presto and many other of a growing list of data processing engines. Our platform, Qubole Data Service (QDS), delivers these best-in-class Apache tools integrated into an enterprise-feature rich platform optimized to run in the cloud at petabyte+ scale. RCG Global Services, a professional services provider since 1974, applies industry expertise to engage in discussions about specific business initiatives. Our repeatable blueprint to affect business change typically involves the application of technology. Our technology design and implementation follows a predictable approach that ensures a solution tailored to the client. RCG provides business-focused Hadoop-based solutions that capture large volumes of data at digital speeds so our clients can realize significant business benefit. We work with clients to determine how data can support business objectives, to define technologies that best fit the environment and to develop the roadmap and implementation. Rocana gives technology leaders total operational visibility, eliminating the boundaries of legacy IT monitoring and empowering technologists to lead digital transformation. Rocana Ops captures and analyzes all data from all sources, keeping it online and available for instant and future access. By combining event data warehouse capabilities with advanced machine learning, Rocana Ops gives technologists the ability to see emerging issues anywhere in the environment, minimize security risks, and surface opportunities for innovation. Search Technologies is the leading trusted and independent technology services consulting firm specializing in the design, implementation, and management of search and big data analytics applications. Our experienced consultants and unique technical assets help us deliver customized search and analytics applications that are easier to use, less expensive, more powerful, and more reliable. We serve more than 700 corporate and government customers around the globe. To learn more, visit us at www.searchtechnologies.com. Semantify is a powerful big data discovery and analytics platform for both Enterprise and Consumer Web applications. It eliminates the dependence on data experts for query fulfilment, so that they can be relieved of mundane data prep and extraction grunt work, and perform highly productive business analysis instead. Semantify is a pioneer in the forefront of democratizing cognitive search and knowledge discovery. It integrates advanced analytics, natural language and machine learning to stitch together in real time, insights hidden across a wide spectrum of information and data sources, within a single, unified and extensible platform. Simba Technologies is the recognized world leader in standards-based data access and analytics products for relational, non-relational and multi-dimensional data sources. Simba’s data connectivity products support multiple interfaces, including ODBC, JDBC, OLE DB, ODBO, XMLA, ADO, ADO.NET, ADOMD and ADOMD.NET on Windows, Mac, UNIX, Linux and iOS. In addition to licensing a wide choice of drivers Simba also offers a developer-friendly custom driver development kit—SimbaEngine X SDK. Simba’s products are trusted by the leading database and BI tools vendors like Alteryx®, Altiscale®, Cloudera®, Couchbase®, Databricks®, DataStax®, Google®, Hortonworks®, MapR®, Microsoft®, Oracle®, Qubole®, SAP®, Splunk®, Tableau®, and Teradata®. In addition to licensing a wide choice of drivers Simba also offers a developer-friendly custom driver development kit—SimbaEngine X SDK. Simba’s products are trusted by the leading database and BI tools vendors like Alteryx®, Altiscale®, Cloudera®, Couchbase®, Databricks®, DataStax®, Google®, Hortonworks®, MapR®, Microsoft®, Oracle®, Qubole®, SAP®, Splunk®, Tableau®, and Teradata®. Skymind is the company behind Deeplearning4j, the only commercial-grade, open-source, distributed deep-learning library written for Java and Scala. Integrated with Hadoop and Spark, Deeplearning4j is specifically designed to run in business environments on distributed GPUs and CPUs. We help enterprises build deep-learning applications for media, images and sound and time series data for finance, healthcare, telecommunications and IoT. SnapLogic is the industry’s first converged data and application integration platform as a service, powering big data ingestion, transformation, and delivery for enterprise data hubs and data lakes. Companies like Adobe, GameStop, CapitalOne and Target rely on SnapLogic's 400+ pre-built connectors, self-service integration interface, and elastic scale-out platform to rapidly connect all of their data sources and endpoints, whether on-premises, in the cloud, or in a hybrid environment. Snowflake Computing, the cloud data warehousing company, was started by leading data experts with the vision to reinvent the data warehouse. Snowflake’s Elastic Data Warehouse is a new enterprise-class data warehouse designed from the ground up for the cloud and today’s data. Snowflake’s patent-pending architecture delivers on-demand elasticity, scalability, and flexibility that makes it possible to bring together all users, all data and all workloads in a single system. Snowflake combines the power and performance of data warehousing, the familiarity and broad ecosystem of standard SQL, and the flexibility of the cloud—at 90% lower cost than traditional solutions. www.snowflake.net. Solix Technologies, Inc., a leader in empowering data-driven enterprises, helps businesses organize their Enterprise Information with optimized infrastructure, data security and advanced analytics by achieving Information Lifecycle Management (ILM) goals. Solix Big Data Suite offers an ILM framework for Enterprise Archiving and Enterprise Data Lake applications with Apache Hadoop as an enterprise data repository. The Solix Enterprise Data Management Suite (Solix EDMS) enables organizations to implement Database Archiving, Test Data Management (Data Subsetting), Data Masking and Application Retirement across all enterprise data. Splice Machine is the open-source SQL RDBMS for mixed operational and analytical workloads, powered by Hadoop and Spark.The Splice Machine RDBMS executes operational workloads on Apache HBase and analytical workloads on Apache Spark. Splice Machine makes it easy to create modern, real-time, scaleable applications or to to offload operational and analytical workloads from expensive Oracle, Teradata, and Netezza systems.The Splice Machine RDBMS has all of the key functionality of industrial SQL databases but on a scale-out architecture typically found in less functional NoSQL systems. Established in 2011, TalkingData is China's leading third-party data service provider based and has completed C-round funding. TalkingData’s corporate culture advocates both the open spirit of internet and the strictness of traditional IT companies, which aims to provide unique, comprehensive smart data solutions that are both creative and rigorous. The unparalleled TalkingData smart data platform combines massive data, ultimate technology and professional consulting service into one, which gradually establishes an open data eco-system that provides unique data value for clients. Currently, TalkingData’s smart data platform covers more than 650 million active independent smart devices each month. ThoughtWorks is a technology company and a community of passionate, purpose-led individuals. Our consultants provide the software know-how to help leading companies bring powerful digital experiences to market, working side by side with our customers to innovate and drive change. As a Transformative IT Authority, Trace3 is the premier provider of IT solutions. We integrate IT products and services with insightful consultation in order to provide total transformation for both executives and organizations. Our elite engineers implement tomorrow’s systems and hardware to solve today’s most pressing IT problems, standing shoulder-to-shoulder with our clients to protect and serve their interests. We pride ourselves on our boutique-style approach to customer service. Our consultants, engineers, and executive team immerse themselves in each client's unique culture in order to better understand their individual needs. From big data intelligence and cloud services to organizational health, we create customized solutions to address all aspects of a client's infrastructure. X15 Software is a next-generation machine and log data analytics company. Our flagship product enables end customers and ISVs to efficiently manage their global event data by leveraging a modern Hadoop-based platform to ingest, index, search, correlate, analyze and visualize millions of events per second and petabytes of historic data. Cool Infographics is one of the most influential infographics and data visualization sites, handling up to 45,000 unique visitors a day. Here you will find cool designs, best practices, links to design tools, conference discounts, jobs board and more! IT Central Station is the leading product review site for software design and other enterprise technology, revolutionizing the enterprise tech buying process through the power of crowdsourced knowledge, online product reviews and social networking. The company has been called an "innovative platform at the forefront of the new social buying process" by IDC and the "Yelp for Enterprise Tech" by the Wall Street Journal. IT Central Station reaches over 22 million tech buyers who access and share unbiased product information and tap into a community of other real users in order to make the best buying decision.